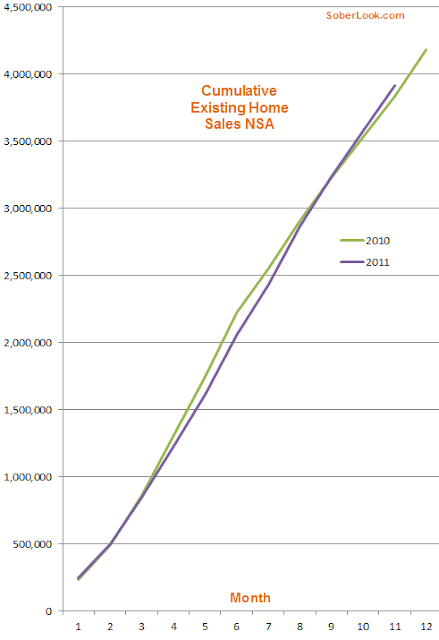 A couple of charts on existing home sales (EHS) data in the US that are worth a look. The first one shows the now infamous 14% downward revision, demonstrating just how badly EHS had dipped in the housing recession. National Association of Realtors (NAR): ...today were periodic benchmark revisions with downward adjustments to sales and inventory data since 2007, led by a decline in for-sale-by-owners. Although rebenchmarking resulted in lower adjustments to several years of home sales data, the month-to-month characterization of market conditions did not change. Right. It seems that NAR had to adjust their estimate of homes sold by owners, for which they don't have monthly data (after all, these guys are realtors). The next chart compares cumulative EHS (NSA) for 2010 and 2011 on top of each other. It's a good way to make year over year comparisons and take out seasonal effects. The "race" started with 2011 behind, but now (with all the adjustments in place) it's starting to look like 2011 will be a winner. We need just over 266,000 sales in December to exceed the total 2010 EHS. That should be easily achievable given the last 3 Decembers averaged 332,000. We are not expecting to see a housing market that could be described as strong. But despite the downward revisions to sales, a modest recovery may be underway. Let's hope they are right.